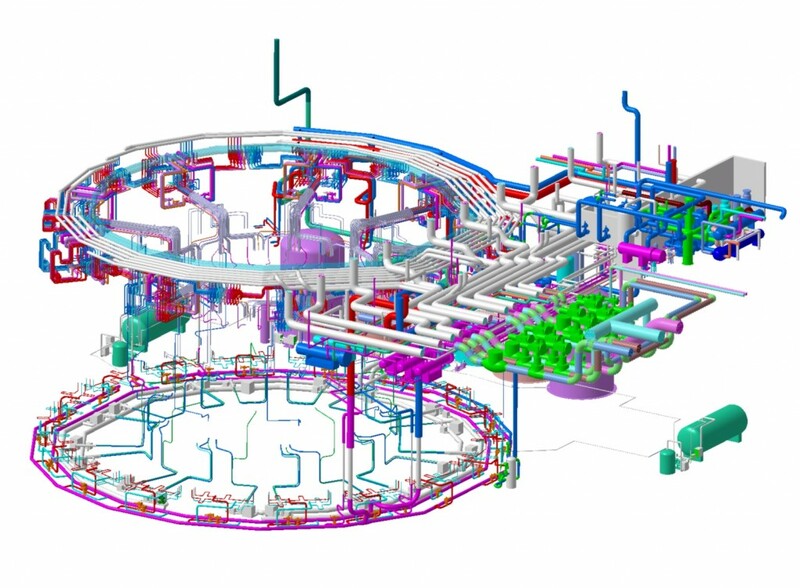 An overall view of the Tokamak cooling water system (TCWS). The deed is done—the team that paved the way for the procurement of the Tokamak cooling water system was all smiles yesterday. 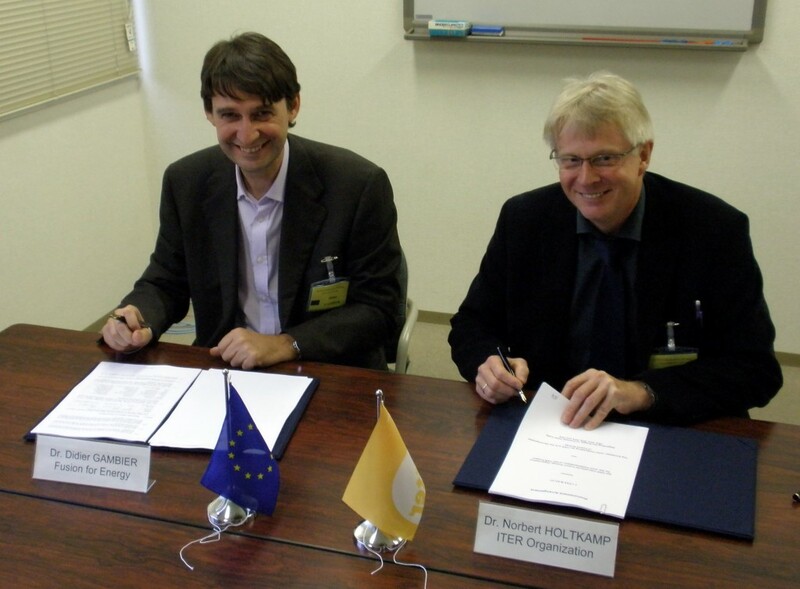 Didier Gambier and Norbert Holtkamp signing the procurement for five out of the six poloidal field coils for ITER. This week, at the ITER Council meeting in Mito, Japan, Procurement Arrangements for the divertor outer target and the Tokamak cooling water system were signed. The outer target will be delivered by Japan; the Tokamak cooling water system by the United States. US ITER also signed the Procurement for its share of the conductors for ITER's toroidal field coils. Today, Norbert Holtkamp, ITER Principal Deputy Director-General and Didier Gambier, Director-General of the European Domestic Agency also signed the contract for ITER's polodial field magnets number 2 to 6. That moves the score of Procurement Arrangements signed up to 23. Located at the very bottom of the vacuum vessel, the ITER divertor is made up of 54 remotely-removable cassettes, each holding three plasma-facing components, or targets. These are the dome and the inner and the outer vertical targets. All three plasma-facing units are coated with tungsten-carbon fibre composite, a high-refractory material. The targets are situated at the intersection of magnetic field lines where the high-energy plasma particles strike the components. Their kinetic energy is transformed into heat; the heat flux received by these components is extremely intense and requires active water cooling. The Tokamak cooling water system (TCWS) consists of four systems: the primary heat transfer systems, the chemical and volume control systems, the drain and refilling systems, and the srying aystem. The heat transfer system shall provide the cooling water for the heat removal during plasma operations for the main in-vessel components: the vacuum vessel, the first wall of the blanket, the divertor, and the neutral beam injectors. It has to maintain the coolant temperatures, pressures and flow rates to ensure component temperatures and thermal margins during the operating campaign. It also provides the cooling water to client systems for heat removal after the plasma shut down, the baking for the vacuum vessel and the in-vessel components. The chemical and volume control systems mainly provide purification of the coolant to minimize the corrosion of the steel and the water volume control for the primary heat transfer systems; the drain and refilling systems provide storage capacity for draining the vacuum vessel and its in-vessel components to permit maintenance; the drying system is a gas circuit that provides nitrogen to blow out the residual water from the in-vessel components, after their draining, also drying them out by evaporation to support the procedure to detect and to localize possible water leaks inside the vacuum vessel. This system shall also provide hot gas (nitrogen or helium) for baking the divertor cassettes at 350 °C permitting the outgassing and removal of hydrogen isotopes from dusts deposited on their surfaces. The total value of the procurement is about EUR 96 million. The third procurement signed in Mito this week was the US share on the manufacturing of the toroidal field conductors, which represents 7.82 percent of the total package. ITER's toroidal magnet system is made up of 18 coils plus one spare. The toroidal field coil conductor is a cable-in-conduit conductor (CICC) made up of superconducting, niobium-tin (Nb3Sn)-based strands mixed with pure copper strands. The strands are assembled in a multi-stage cable around an open central spiral. The cable and its spiral are then inserted inside a stainless steel jacket. The jacket provides the helium confinement and must conform to the leak tightness standard defined herein. The copper and Nb3Sn-based strands are chromium plated to prevent sintering during heat treatment and control strand-to-strand contact resistances. Last but not least, Didier Gambier signed the Procurement Arrangement for ITER's poloidal field coils 2 to 6 on behalf of Europe. Poloidal field coil number one will be manufactured by Russia. The poloidal field magnets pinch the plasma away from the walls and contribute in this way to maintaining the plasma's shape and stability. The poloidal field is induced both by the magnets and by the current drive in the plasma itself. The poloidal field coil system consists of six horizontal coils placed outside the toroidal magnet structure. Due to their size, the actual winding of five of the six poloidal field coils will take place in a dedicated, 250-metre long coil winding building on the ITER site in Cadarache. The smallest of the poloidal field coils will be manufactured offsite and delivered finished. The ITER poloidal field coils are also made of cable-in-conduit conductors. Two different types of strands are used according to operating requirements, each displaying differences in high-current and high-temperature behaviour. The total value of this procurement is worth about EUR 63 million.